Bene’s Career Academy provides career preparation in the Cosmetology arts and sciences including Barbering, Skin Care, Instructor Training, Massage Therapy and Nail Care in order to prepare the student for employment in the Beauty Industry to serve God, the family and community. Bene’s Career Academy, is a private school specializing in vocational training in Cosmetology and related arts and sciences. Each course/program has been scheduled for completion with an allotted time frame. A grace period of approximately 25% has been added to the calculated completion date for each program. This 25% is based on our attendance policy of 75%. It is not realistic to expect to receive an education for free. The school has reserved space, equipment, and licensed instructors for each student and course/program. If a student does not graduate within the contracted period, additional training will be billed at the rate of $5 per hour, payable in advance, until graduation. Students will not be allowed to clock in until applicable daily payments are made. 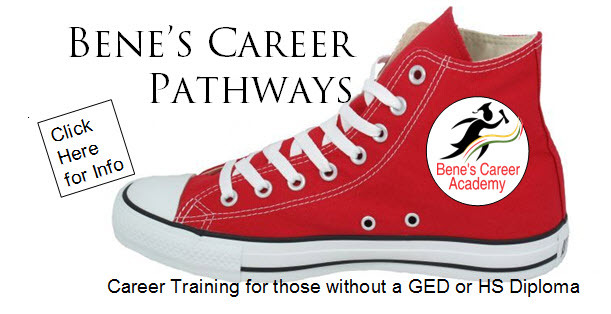 Bene’s Career Academy is open Monday through Friday from 8:00 a.m. - 10:00 p.m. and Saturday from 9:00 a.m. - 5:00 p.m. (massage only). Our students are expected to come to school according to their contract. If for any reason a student needs to be excused, he will be expected to make arrangements with the teacher to make up the time the following week between 2:00 and 10:00 p.m., Monday through Friday.Massage Therapy students must make up a missed clinic day on another clinic day. There are no exceptions. ​Transfer Students – Midpoint of the contract hours or the established evaluation period whichever comes first. Evaluations will determine if the student has met the minimum requirement for satisfactory academic progress. The frequency of evaluations ensure that students have had at least one evaluation by midpoint in the course. Academic Progress Evaluations The qualitative element used to determine academic progress is a reasonable system of grades as determined by assigned academic learning. Students are assigned Tuition MASSAGE THERAPY - 600 Hours 16.00 per clock hr Tuition 9,600.00* Registration Fee 150.00 Cost of Program Includes Books, 2 Pairs of Scrubs and Lotion Holder Total Cost $9,750.00 Payment Schedule* The student has the option of paying the tuition costs: 1. In full prior to attending the first class, or 2. Paying the unpaid balance in equal weekly or monthly installments. *Financial Aid is available to those who qualify. Extra Supplies 2 or 3 binders or folders (for handouts) highlighters (for theory books) index cards (for muscle learning) paper (for note taking) academic learning and a minimum number of practical experiences. Academic learning is evaluated after each unit study. Practical assignments are evaluated as completed and counted towards course completion only when rated as satisfactory or better (the computer system will reflect completion of the practical assignment as 100% rating.) If the performance does not meet satisfactory requirements, it is not counted and the performance must be repeated. At least two comprehensive practical skills evaluations will be conducted during the course of study. Practical skills are evaluated according to text procedures and set practical skills evaluation criteria adopted by the school. Student must maintain a written grade average of 80% and pass a FINAL written and practical exam prior to graduation. Student must make up failed or missed tests and incomplete assignments. Students must Clock In and Out on the computer in their Education Center. A student must maintain a minimum of 75% of his or her contracted hours. Student’s attendance will be monitored monthly. All absences must be called into the office at ext. 304. Leave of Absences Leave of absence (LOA) is a temporary interruption in a student’s program of study at the request of the student for personal reasons. The request of the student must be submitted in advance in writing, include the reason for the student’s request and include the student’s signature. The student must have the expectation that they will return from the LOA to finish their program. In the case of unforeseen circumstances such as injury, the request can be made verbally. The student must then fill out the proper form as soon as they are able. In the case of unforeseen circumstances, the leave of absence will be dated for the first day the student was unable to attend. No additional charges will result from the LOA. LOA must be a minimum of 30 days and a maximum of 180 days in any 12 month period. A student’s contract will be extended by the same number of days taken in the LOA. A contract addendum with the new dates will be signed by all parties. Class Change Policy Class changes from nights to days or days to nights are allowed one time unless there are mitigating circumstances. 1. An applicant is not accepted by the school. The applicant shall be entitled to a refund of all monies paid. 2.A student (or in the case of a student under legal age, his/her parent or guardian) cancels his/her enrollment in writing within three business days of signing the enrollment agreement. In this case, all monies collected by the school shall be refunded, regardless of whether or not the student has actually started classes. 3. A student cancels his/her enrollment after three business days of signing the contract, but prior to starting classes. In these cases, he/she shall be entitled to a refund of all monies paid to the school less the registration fee in the amount of $150. 4. A student notifies the institution of his/her withdrawal in writing. 5. A student on an approved leave of absence notifies the school that he/she will not be returning. The date of withdrawal shall be the earlier of the date of expiration of the leave of absence or the date the student notifies the institution that the student will not be returning. 7. In type 2, 3, 4 or 5, official cancellations or withdrawals, the cancellation date will be determined by the postmark on the written notification, or the date said notification is delivered to the school administrator or owner in person. All refunds will be calculated on a prorata basis calculated by the length of time the student remains enrolled, up to a minimum of 40% of the program, multiplied by the cost of the program. Enrollment end date will be based on the student’s last date of attendance. Any monies due a student who withdraws shall be refunded with 30 days of a determination that a student has withdrawn, whether officially or unofficially. In the case of disabling illness or injury, death in the student’s immediate family or other documented mitigating circumstances, a reasonable and fair refund settlement will be made. If permanently closed or no longer offering instruction after a student has enrolled, the school will provide a pro-rata refund of tuition to the student OR provide course completion through a pre-arranged teach out agreement with another institution. IF the course is cancelled subsequent to a student’s enrollment, the school will either provide a full refund of all monies paid or completion of the course at a later time. If the course is cancelled after students have enrolled and instruction has begun, the school shall provide, the school shall provide a pro rata refund for all students transferring to another school based on the hours accepted by the receiving school OR provide completion of the course OR participate in a Teach-Out Agreement OR provide a full refund of all monies paid. • Students who withdraw or terminate prior to course completion are charged a cancellation or administrative fee of $150.00. This refund policy applies to tuition and fees charged in the enrollment agreement. Other miscellaneous charges the student may have incurred at the institution (EG: extra kit materials, books, products, unreturned school property, etc.) will be calculated separately at the time of withdrawal. All fees are identified in the catalog and in this enrollment agreement. ​Return of Title IV If a Title IV financial aid recipient withdraws prior to course completion, a calculation for return of TIV funds will be completed and any applicable returns by the school shall be paid, as applicable, first to unsubsidized Federal Stafford Student Loan Program; second to subsidized Federal Stafford Student Loan Program; third to Federal Pell Grant Program; fourth to other Federal, State, private or institutional student financial assistance programs; and last to the student. After all applicable returns to TIV aid have been made, this refund policy will apply to determine the amount earned by the school and owed by the student. If the student has received personal payments of Title IV aid, he/she may be required to refund the aid to the applicable program.